We offer three delicious cake flavours for our cupcakes. With so many cupcake icing options, you’ll never run out of new cupcake cake & icing combinations! Want to add a little spice into your cupcakes? 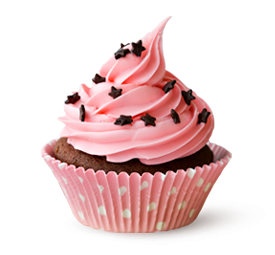 Try adding one of our delicious cupcake toppers at no charge! Is your mouth watering? Order Now! "Your cupcakes were absolutely amazing! They were all gone minutes after I put the tray on the table"
"It's like you mix a little bit of love into every batch! Incredible!" "Thank you for making & delivering such a big order of cupcakes! The kids loved them so much."